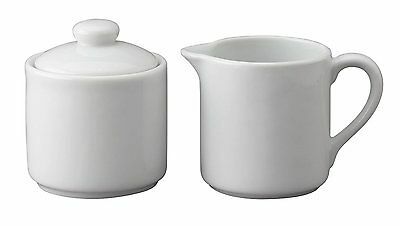 6-ounce Porcelain Sugar and Creamer set is an elegant way to serve cream and sugar for a coffee and tea service for two. Sugar bowl with lid for storing and serving all types of sugar, like granulated sugar, sugar in the raw, brown sugar or sugar substitutes like stevia . Traditional shape is a versatile addition to coffee and tea accessories; complements any décor. Great gifts for tea lovers, or hostess gifts and coffee gifts for at-home baristas; also use for serving marmalade, jam, condiments and sauces, too. SUGAR: 3" x 3" x 3 1/2" (W/LID) CREAMER: 4 1/4" x 2 3/4" (DIAMETER) x 3"